DETROIT — A scoreless second quarter sent the Lions into the locker room with a 17-0 lead over the Packers on Thursday night at Ford Field in Detroit. The Packers started the second quarter with a first down at the Detroit 37-yard line, and they moved into the red zone on a 19-yard pass to TE Richard Rodgers. QB Aaron Rodgers was sacked on third down, though, and K Mason Crosby hit the left upright on a 41-yard FG try, keeping the Packers scoreless. On the next defensive series, Packers CB Quinten Rollins returned from his forearm injury, and he broke up a pass on third down for a three-and-out. The Packers responded with a three-and-out of their own, though, as Lions DE Devin Taylor had his second sack in as many series. The Packers got a sack back of their own on the Lions next drive, as DB Micah Hyde got home on a blitz, for another three-and-out. 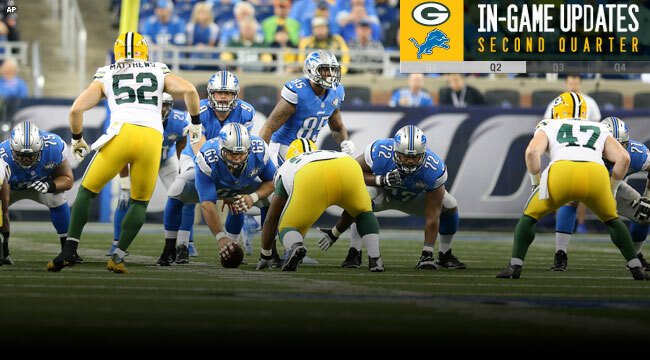 Green Bay reached midfield on its next possession with the help of a third-down pass interference penalty on Lions CB Quandre Diggs, but then C Corey Linsley exited the game with an ankle injury. His replacement, JC Tretter, was called for holding on his first snap, and the Packers had to punt again. The Packers got one more crack on offense in the half after S Ha Ha Clinton-Dix sacked Lions QB Matthew Stafford on third down, taking over on their own 28 with 2:11 left. But RB James Starks was stopped for no gain on 3rd & 1, and the Packers had to punt with 1:46 left. Detroit didn’t do anything with the ball, either, as RB Theo Riddick was tackled just shy of the first-down marker by CB Casey Hayward on a third-down screen pass.